The End of Floor Paint? 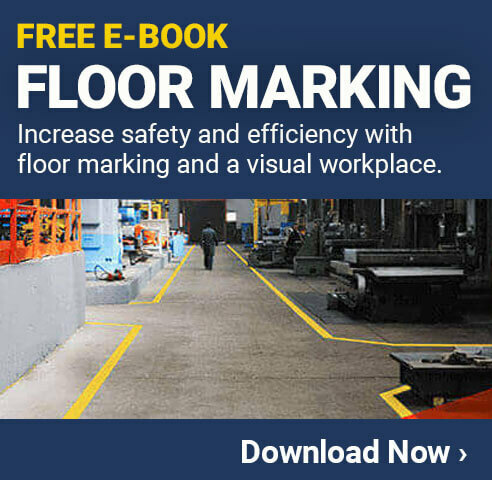 Whether you’re trying to improve safety in the workplace or implementing the Lean process known as 5S, aisle and floor marking are extremely important to your cause. For years, organizations relied on floor paint to address these needs, mainly because there was nothing else out there. The improvements and technologies in floor tape have provided floor paint with it’s first real competition. In fact, most would say that the benefits of using floor tape over floor paint are increasingly becoming more clear when you’re laying down your organizational lines in your facility. Floor tape has proven to be more dependable with a longer life-span than floor paint and with more facilities implementing 5S, floor paint seems to be becoming a thing of the past. But how do you decide which floor tape is best for you? With the demand at an all-time high, more floor tape brands are popping up everywhere. It makes it tough when you’re trying to decide which tape you want, but one company is trying to help by providing free samples of their industry leading floor tape. The free offer includes samples of their best floor tape lines, all designed to improve your organization by making it safer, more efficient, productive, and 5S ready. Still Not Sure About Floor Tape? It’s tough breaking old habits. Replacing your painted lines every few months may be a ritual that you truly look forward to, but maybe it’s time to start new rituals. When you start looking at the facts, there really is no competition when comparing the two. Floor paint requires more materials, man hours, and down time while you wait for your paint to dry, in some cases up to 72 hours! Also, did I mention floor paint has a shorter life span? To be effective, floor paint needs to be re-applied often to keep operations running safe and organized. If you are one of the many looking to implement 5S, you’re doing it for a reason. You want to eliminate waste and increase productivity in the workplace. Stopping the flow of work while you paint, using valuable man hours to paint, the frustrations that come with the painting process, are all examples of activities you need to be eliminating from your organization if you truly want to increase productivity in your workplace. When you have products like SafetyTac Floor Tape, it becomes clear why more organizations are using the more efficient, less hassle method to help implement 5S. For starters, SafetyTac is now recognized as the leading brand in the industrial floor marking industry. It’s been put up against some of the toughest tests a facility can throw at it including forklifts, trucks, heavy foot traffic, chemicals, greases, and pallets. The tape has passed all tests with flying colors. The tough PVC material, low-profile design and dual tampered edges allow SafetyTac tape to stand up against any threats and pass by the competition. The tape holds up to OSHA standards and is great for all your 5S needs including forklift lanes, manufacturing floors, warehouse floors, work area boundaries, and safety areas. It comes in a variety of colors and widths to meet any marking need you may have. To get your free box of SafetyTac Floor Tape samples, contact Creative Safety Supply at 1-866-777-1360 by phone, or by email at info@creativesafetysupply.com, or by simply clicking here.